Where were you when you first heard the sound? Good sounds – your husband’s voice, your baby’s giggle, the words “I love you?” Do you remember? Can you picture the scene and surroundings? I experienced a condensed courtship with my wife because I was briefly called back to service during Desert Storm. I don’t recall the first expression of the four- letter L word in our relationship. I know it came, and stuck. I have said it to her every day for nearly twenty-two years. I say it every night to my girls and sometimes in front of other people, much to their chagrin. I wish I remembered the first time I said it, though. I will never forget the first time I heard the word Cancer as it related to my family. I was in the hospital just a week ago when it was introduced to me, while my little girl lay sleeping nearby. The doctor actually used the words “oncological event” before I made him dumb it down for me. Cancer. It was then I realized this isn’t everyone’s diagnosis. It is Kylie’s and ours: our family’s, our friends and network of support. But the rest of the world will continue to march on around us. I will add a link to Kylie’s Caring Bridge at the end of this post because I won’t allow cancer to dominate my writing. It will peak its evil head in from time to time, I have no doubt. But I won’t allow it to take over my life, steal my joy, soil my faith, or crush my little girl. It took a while to determine the enemy. Until then, we’ve been punching at shadows. Now we start to take it out. We are at the beginning of a long road, but there is hope. Kylie knows what is going on, she is scared. We cried together and prayed. She has decided that this is happening because God must have a really big, great plan for her. I don’t know if I could have gotten to those words so quickly at twelve – she’s just chock-full of amazing. 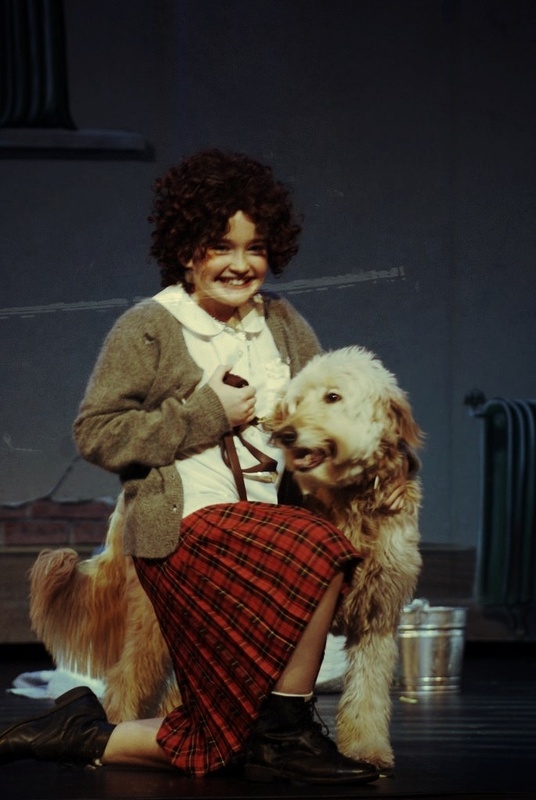 The picture I added is one of Kylie as Annie in her school play a couple of years ago. She is an incredible actress and I can’t wait to see her on stage again. Thank you for the fighting words. Adding your sweet girl to my prayer list. Thank you for adding the Caring Bridge link. I am so blessed at her strong faith. God truly does have a plan, and it is for good–even if we cannot understand it many times. Thanks Paul, I am positive I will hit all of those emotions. Right now, I just want to lace up the gloves. Good for you. This is a fight of many rounds. Warrior mode is good. We are praying here too! God bless your whole family. thank you, that is what we need. I will most definitely pray on this for you. We had a similar scare with my oldest only two years ago and were about to schedule chemo and checking out home based learning. He is still “officially” diagnosed with a 1 in 5 million disease. Cam was stronger that both my husband and I. These kids really know what they are talking during these trials and can lead US in this journey. I “think” you are in the ATL metro area with me. If you haven’t, please check out the Afleck cancer/blood disorder at Children’s Hospital Emory. I recommend them hands down! Will be keeping all of you in prayer and praying for the miraculous! Thank you. I am sitting in the Aflac center right now. We have the best care around, of that I’m sure. Mark, my sincerest heartfelt emotions are with you, and Kylie, and your whole family, as well as my prayers. Having been through a similar circumstance with a child it can be tremendously difficult with every emotion from time to time. May the Comforter do His work with you all at this time. Thank you Levi. We feel surrounded in His love and expect Him to show himself. I am certain He will Mark. Your prayers and ours for you have been heard and answered. Mark, I pray God shows you his strength and design. Your best assault weapon is the sword of Truth! We are standing with you guys. We will speak the truth and fight this battle and hopefully be able to relieve you, refresh and encourage you, worship together and see the goodness of the Lord every step we advance. Praise is an atomic weapon against fear! Thank you Williamsons, Kylie smiled when I read this to her. my brother heads a non-profit that funds research for all types of peds cancer if you would ever like to talk to him or pick his brain or see all of the options available. he would be happy to do so. Thank you for the offer Beth. I truly feel like we are in good hands, but I’m not sure of a lot right now. Mark, your family is close and brave and strong together. I have noticed before how dear you are to each other. I am not religious, but I do believe the love you share is a reflection of something greater than the sum of you all and that this love will prevail throughout your fight against Kylie’s illness. My heart goes out to you and Robin, and even more to little Kylie. Thinking of you during this difficult time, Val. Thank you Val, I appreciate your concern and thoughts, always. Oh Mark, I really feel for you and your wife. For your family. I’m sitting here writing this in tears, sincerely crying and feeling for you guys. I know there aren’t really any words that can calm the storm that I’m sure is going on you and your wife right now. Please just know that I’m feeling and praying for you. Nothing touches us or moves us like the needs of our children. Praying with you for Kylie’s healing. Thank you. We need some healing. I don’t know you but came across this on a friend’s Facebook timeline. As a Mom, I can’t even begin to imagine what you are feeling. Please know that Kylie and your family are in my prayers. Thank you so much, Shannon. I’m glad you saw it and appreciate the prayers. Mark, only God knows what tomorrow brings, but I’m betting that our sweet Kylie will continue to touch a lot of lives and even witness and save some souls through all of this. My prayer is for a miracle and that God will save you all from this horrible nightmare. We’re putting on our gloves to fight along with you. Thank you a Terry. We need you in our corner. Thank you. She is a tough kid and we are fighting, with God on our side. I so appreciate the prayers. Chock-full of amazing? yep, that’s Kylie alright. Boxing gloves? Yep, that’s you Mark. Surrounding all of you as prayers warriors? That’s all of us! I hate, hate ,hate cancer. Even so, the comments made me twitch a little bit of a smile because people who do not even know The Amazing Kylie are cheering for her healing! God hear our prayers! Myers Family- be aware of our collective supporting hug. Love you. Thank you so much Melissa. We feel the support and appreciate the prayers.